Ice hockey fans had (have!) 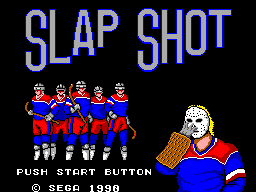 a choice of two games to choose from on the SMS - Slap Shot or Great Ice Hockey. You had a choice of 24 country teams split across 3 different classes - A, B and C. The classes essentially replicate skills levels - the A country teams (USA, Canada and the mighty Czechoslavakia! etc) can all skate much faster leading to a more enjoyable faster experience. 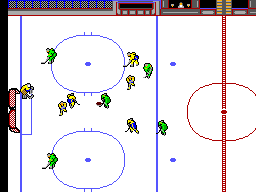 Button 1 shoots, button 2 passes, and when you don't have the puck you can press the button to change players.To tackle just skate directly into the opponent. This works quite well and it is pretty easy to block your opponents progress and, if lucky you will steal the puck (or knock him over or be knocked over yourself). On occasion when two players collide you change to a cut scene where you have to hammer the buttons to win the fight. The loser is carted off to the sin bin leading to a power play. The Computer is easy to score against in league C, very tough in A. However there is a glitch in the programming - if you shoot from the blue line the computer seems unable to move their keeper intime. 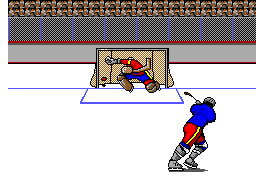 Basic, although the animation on each player is quite good (you can see their little skates moving). You get a little cut scene each time you score (see screen shot) and you also get a dressing room scene at the end of the 2nd period for the managers team talk which is also quite nice. Music is played throughout the match (a different tune depending on which class you can choose. Really good - they have built in the feeling of skating on ice really nicely with some good momentum mechanics. Players are all responsive to the inputs and hence this works really well as a two player game. As well as controlling your player you simultaneously control the goalie. When the opponent heads towards your goal you have to forget about the player you are controlling and focus on your keeper. This works well as your other players will try and pick up the puck if you manage to save it. This is quite funny in 2 player as you are always trying to judge if your opponent is focusing on defence or goalie. If you think they are playing defence then you can try a sneaky shot as their keeper will likely be well of position. This adds an interesting dynamic to the two player matches. Que much swearing as the puck trickles over their goal line! Limited in 1 player due to the long range goal scoring glitch. However the fun never stops in the 2 player game. So if you have someone else to play with then the replay value is high. The simplicity of this game makes it easy to pick up and play while the tight controls mean everything works as it should.